DUII – D is for Driving. What does it mean to drive? 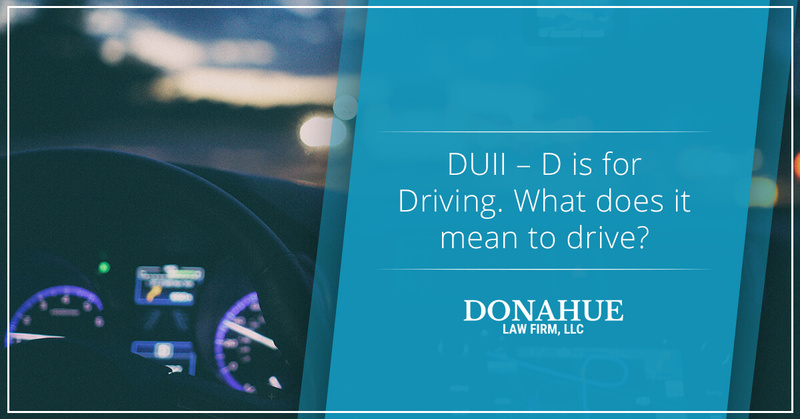 In Oregon, the “D” in the acronym DUII, stands for driving. More specifically, driving a vehicle. Surprising, isn’t it? It doesn’t take a rocket-scientist, or a criminal defense lawyer to tell you what most people already know: You have to be driving something to get a DUII. But what does “driving” mean, legally speaking? Many people think so long as the car isn’t actually running they can’t be arrested for DUI. Once a client told me he should have shut the car off and rolled down the hill when he saw the police. At least then he wouldn’t have been “driving”. While that may seem like a great idea, a great theory doesn’t always pan out in practice. The opening sentence of the Oregon DUII statue, ORS 813.010, lays out in pretty simple, yet somewhat unhelpful terms: ORS 813.010(1) “A person commits the offense of . . . if the person drives a vehicle . . .” So you’ve got to be driving a vehicle. Great. Not only does that not clarify the term “driving”, but you’re now left wondering, what counts as a “vehicle”? What does it mean to be “driving” in a DUII? When the legislature writes laws that are otherwise unclear and the dictionary definition, or plain meaning, is unhelpful, we turn to the Courts. In the 1993 case, State v. Cruz, the Oregon Court of Appeals addressed what it means to drive a vehicle. In Cruz, the defendant grabbed the steering wheel and pressed the gas pedal while in the passenger seat (more or less “in” the passenger seat). The Court held that for purposes of DUII, driving includes operating, towing, moving, or otherwise propelling a vehicle in any way. Accordingly, despite being in the passenger seat, while a driver was in the driver’s seat, Cruz had driven the vehicle for the purposes of the statute. The Cruz decision was further affirmed in a 2009 Appeals decision, State v. Bilsborrow, holding that the vehicle must be in motion. Does accidental driving count as a DUII? What Cruz did not address was whether driving includes accidental acts that cause movement of the vehicle. This question was addressed in a 1995 Oregon Court of Appeals decision. In Moe v. MVD, plaintiff appealed an order from the trial court affirming a suspension of his license for failing to take a breathalyzer test (part of Oregon’s Implied Consent Law). On the night in question, Moe was the passenger in his friend’s vehicle. “Nature had called” his friend out of the vehicle, and while away, an intoxicated Moe turned the vehicle on and reached across to the driver’s window controls to roll down his passenger-side window. In doing so, he inadvertently struck the gearshift, popping the car into gear. The car jerked forward hitting a total of eight cars before finally coming to a stop. After police arrived, an intoxicated Moe was arrested for DUII. Moe’s argument, his only argument, was that he could not have been “driving” because something more than accidental conduct was required — what is termed a “volitional act”. The Court, hesitant to read such a requirement into the statute, ruled otherwise. The Court held that even accidental conduct constituting movement or propulsion of a vehicle is “driving” within the context of the DUII statute. What these cases suggest, if not downright tell us, is if you do something that causes a car to move, whether you meant to do that thing or not, and you’re intoxicated, you are “driving” for the purposes of a DUII case. On the flip-side, these cases also suggest you can be sitting in an idling car, adjusting the seat, charging your phone, whatever you want while the car is running, even sitting in the driver’s seat doing all of the above, without running the risk of getting a DUII. Now, I’m not suggesting you test this. There are still other laws you can be arrested for if you do one, or a combination of the above while under the influence. Nonetheless, at least within the context of DUII, to drive or operate a vehicle requires some sort of movement of the vehicle.